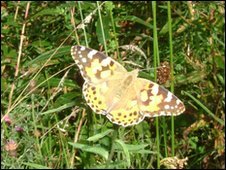 Countryside rangers in Stirling are appealing for people to help them with a butterfly survey. Stirling Countryside Ranger Service wants locals to count the numbers and types of butterflies on Fallin Bing and Plean Country Park. Information from the surveys, which run from April to September, will be fed into national butterfly research. One survey is required per week. The ranger service is offering training to anyone interested in helping out. There are 22 species of butterfly known to occur in the Stirling area, including the endangered large heath. Ranger Jennifer Davidson said: "This is a perfect opportunity to get to know about local butterfly species and about the habitat you are counting them in. "If you already walk in these areas this is a great way to help the local nature as every local record helps to build up a national picture." Training sessions will be held at Plean Country Park on 23 March and Fallin Bing on 24 March.